Within the human body lies an important sensory system called interoception. 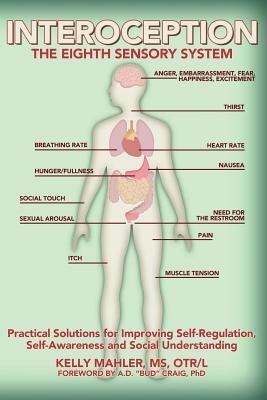 Interoception enables us to experience essential feelings such as hunger, fullness, thirst, itch, pain, body temperature, nausea, need for the bathroom, tickle, physical exertion and sexual arousal. Additionally, interoception allows us to feel our emotions. As with other sensory systems, the interoceptive system can be impacted in individuals with autism. Interoception is a hot topic in other fields, however, up until this point, little has been discussed about interoception in the field of autism. Interoception: The Eighth Sensory System provides a detailed connection between interoception and common experiences of individuals with autism. "Mahler provides research and practical strategies that can be easily implemented across the lifespan to help individuals manage their bodies, emotions and self-regulation" (Brenda Myles, PhD). The research showing just how important interoception is to many aspects of life is unequivocal. Interoception: The Eighth Sensory delivers an overview of this research and describes the clear link between interoception and important skill areas such as self-awareness, self-regulation, problem solving, social intuition, perspective taking and many more.